Monkey around at Twycross Zoo, and meet our closest animal relatives in the flesh. A lively zoo park with animal friends aplenty, Twycross Zoo has a large collection of animals from Twycross Zoo is a zoo park that is also very committed to conservation, so as well as being a fun place to go, you know that the money you spend is helping with things like captive breeding programs that can help prevent rare animals becoming extinct. You can learn a lot about the animals at the zoo whatever your age thanks to information displayed all around the park, and regular expert talks that you can attend. For a day out that is as educational as it is fun and inspiring, be sure to arm yourself with vouchercloud offers and bring the whole family! Twycross Zoo is designed to be a year-round attraction, and the zoo has lots of good facilities including pleasant places to eat and places for younger kids to play. How do I use my Twycross Zoo vouchers? Sign up to vouchercloud and we'll keep you informed about the newest great money saving deals at Twycross Zoo and other great UK days out! 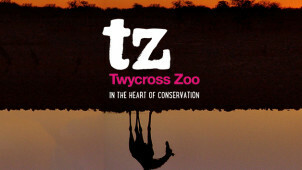 Check out Twycross Zoo's Facebook page to become the first to hear about discounts and deals! When is Twycross Zoo open? The zoo is open every day of the year except Christmas Day. It opens at 10 am all year round, and closes at 5 pm in winter and 6 pm in summer. Are there places to eat at Twycross Zoo? Twycross Zoo has several good restaurants and cafes to have lunch or get coffee, cake and other refreshments. How do I get to Twycross Zoo? You can get to Twycross Zoo by bus or by car. You'll find all the details, including the address and directions online here. Twycross Zoo in Warwickshire is one of the most popular animal attractions in Britain, and a fantastic place to go for an epic day out to see rare animals and learn more about them. The zoo is a specialist in primates, so it is the best place in the UK to see apes like chimps, bonobos, orangutans and gorillas. You and your friends or family can have a fun day out for less when you check out the latest Twycross Zoo vouchers from vouchercloud. Of course, while you're at the zoo, be sure to take in feeding times to get a closer look at some of your favourite creatures! If you know someone who loves animals and cares about the conservation of endangered species like the ones at Twycross Zoo, you can adopt an animal for them as a great gift! Prices vary depending on the animal you choose and whether you adopt it on your own or with other people, but the package for adopting any animal includes tickets to go and visit your animal at the zoo (how many tickets depends on the level of adoption you choose), a soft toy and photo of your animal, a fact sheet, and a cute adoption certificate with your name (or the name of the person you gift it to) on it. There is so much to see at Twycross Zoo, you’ll want to come back again and again. Investing in an annual pass is the best value way to get more out of Twycross and buying with one of our Twycross Zoo offers can ease the pressure on your budget. Twycross Zoo membership comes with all sorts of perks, including discounted entry to events, free entry to partner zoos and you’ll be supporting Twycross’ amazing conservation work too.